Somehow she squeezed in time to shoot a music video in between dates. The video is for her single “Good Girls” from the debut EP Middle of Hollywood. The video features Francesca Eastwood (Hollywood offspring and E! network’s Mrs. Eastwood & Company star) and directed by Director X (Justin Bieber, The Wanted, Nicki Minaj). The video will premiere on AOL on Tuesday July 17. The star recently shared with OK! MAgazine some backstage One Direction antics, check out the inside scoop here and keep up with Manika online below. The 18-year old star is a lucky girl to have toured with One Direction and is gaining tons of press, including major teen and celebrity buzz via Seventeen, Just Jared Jr., AOL Music,Celebuzz, Buzznet, Twist Magazine, Popstar!, Girls Life and more! While fans wait patiently to see Manika’s new video, they have ONE MORE DAY to submit homemade videos for a “Good Girls” lyric video contest. The winner of the best lyric video will win an autographed Daisy Rock Girl guitar. They can also complete a few simple tasks to win other great prizes including autographed Manika prize packs and an exclusive track. Click HERE for details over at SuperGlued! Use the links below for tour dates and to keep up with Manika online. The Middle Of Hollywood EP is available at F.Y.E. and everywhere music is sold. Teen pop star MANIKA is hot off the heels of a 20-date tour opening up for boy band sensation One Direction! She just finished filming her music video for the single “Good Girls” off her new EP Middle of Hollywood. The video was written and directed by Director X (famed for Justin Bieber’s “Boyfriend” video) and features a cameo from Francesca Eastwood, Clint Eastwood’s daughter and rising young actress. The 18-year old star is a lucky girl to have toured with One Direction and is gaining tons of press, including major teen and celebrity buzz via Seventeen, Just Jared Jr., AOL Music, Celebuzz, Buzznet, Twist Magazine, Popstar!, Girls Life and more! While fans wait patiently to see Manika’s new video, they can help out with her “Good Girls” lyric video. Fans can submit homemade videos for a chance to win an autographed Daisy Rock Girl guitar. They can also complete a few simple tasks to win other great prizes including autographed Manika prize packs and an exclusive track. Click HERE for details over at SuperGlued! 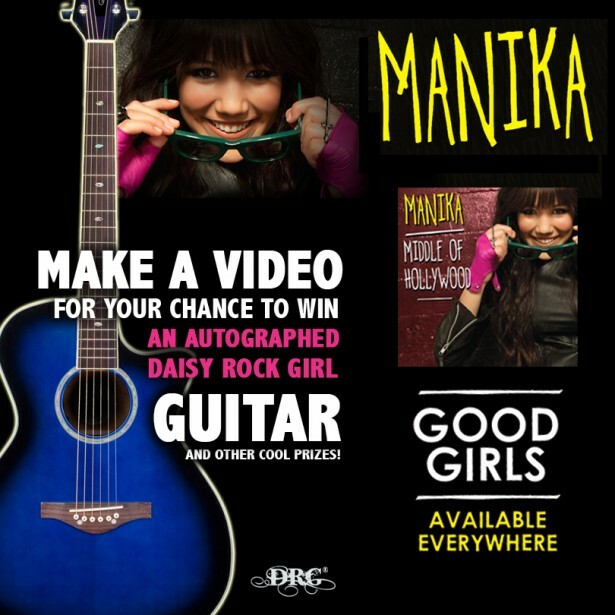 Win Manika’s Autographed Daisy Rock Girl Guitar, Tickets and more! Since teen pop star Manika is busy on the road with One Direction, she needs help with her “Good Girls” lyric video. Fans can submit homemade videos for a chance to win an autographed Daisy Rock Girl guitar. They can also complete a few simple tasks to win other great prizes including autographed Manika prize packs and an exclusive track. Click HERE for details over at SuperGlued! Want to see Manika and One Direction? You can enter to win tickets to the remaining dates in Florida at WebDoc and F.Y.E. Also check out Manika’s recent interview on Metrolyrics.com to see what’s on Manika’s musical mind. Did you know she’s a huge fan of Alanis Morrisette? Read more here. Eighteen-year-old pop artist, MANIKA, is set to debut her “Good Girls” anthem on Top 40 Radio June 5th and tour with teen heartthrobs, One Direction, this summer. MANIKA made an announcement on Tuesday, May 15th, that her highly anticipated second single, “Good Girls” will be added to Top 40 Radio starting June 5th. This fun, energetic pop track is destined to be an anthem for all the “good girls” out there and meant to be turned up loud! Listen to “Good Girls” before it hits radio on SoundCloud. The June release follows her breakout Top 40 pop hit “Just Can’t Let You Go” featuring Young Money’s Lil Twist. “Good Girls” is the lead single from her debut, five-track EP entitled , The Middle of Hollywood EP, slated for release May 22nd via Wamaframa Records/CCA Entertainment. Watch the video for “Just Can’t Let You Go” on YouTube. MANIKA, a fresh and positive role model for teens, is also jet setting across the nation with special performances. She has been chosen by teen sensation, One Direction, the first British group to ever have their first record debut at #1, to be the opening act on their North American Summer Tour. In between performances with One Direction, MANIKA, a former girl scout herself, will also headline a few dates of The Girl Scouts of America 100th Anniversary Tour. MANIKA performed last Saturday on May 12 on the Village Stage at KIIS-FM’s Wango Tango alongside Nicki Minaj, Pitbull and Maroon 5.
audio ‘stache: Will You Be MANIKA’s Valentine? Watch a special message from Manika below and get the free download for Valentine here. MANIKA, 18-year-old emerging pop artist released her debut single in 2011, “Just Can’t Let You Go” featuring Lil Twist with nationwide spins on Top 40 radio. The pop-star vocalist is an active member in the fight against cyber-bullying as the newest face of the explosive NOH8 Campaign. Manika pledges, “45% of today’s youth have been cyber-bullied in the past year. I truly believe that everyone is entitled to have their own unique voice. Everyone is different and that’s what makes us beautiful. We should respect people’s differences, not bully them for it. I pledge to do everything I possibly can with NOH8 as a musical artist – and as a human being – to end cyber bullying.” Read more about the NOH8 Campaign here. Last summer, Manika completed a Shop Til You Rock tour, a music-inspired mall tour that empowers teens to look and feel like rock stars. The tour hit 38 mall locations and was sponsored by Pepsi and Gamestop. Additionally, Clear Channel’s iheartradio selected Manika as an “Artist To Watch” for their NEW! Discover and Uncover program, and Manika was featured on a recent All Access Journeys airing hourly in all of their retail stores nationwide. Manika was discovered by the late-great Frank DiLeo (Michael Jackson‘s long-time manager), and revered music coach CeCe Sammy of UK’s Pop Idol. Manika (pronounced Ma-NEE-ka), whose mixed heritage includes Filipino, Japanese, Chinese, Malaysian and Spanish, is currently in the studio collaborating with A-list songwriters/producers for her full-length debut, including Tearce and Francci, and such heavy hitters as Qura Rankin and Evan Bogart (Beyonce, Rihanna, Leona Lewis, Natasha Bedingfield, Jennifer Lopez). Emerging pop recording artist MANIKA, managed by Frank DiLeo,Michael Jackson’s long-time manager, and revered-music coach CeCe Sammy of UK’sPop Idol, are releasing her debut single on Wamaframa Records distributed by Sony/RED titled “Just Can’t Let You Go.” The song, featuring Young Money’s LIL TWIST, will be available digitally on June 14. MANIKA is currently in the studio recording her full-length debut, and will be touring later in 2011.